The beginning of August is a unique period of a football fan’s calendar. Not because we can entertain the prospect of possibly going to a match in short sleeves and maybe even shorts, and not because we can walk down to Elland Road for an evening game in daylight and eat our pre-match burger as if we were back on holiday in a Mediterranean street café. Or something like that. No, it’s because every football fan starts the season with a clean slate and an often over-sized chunk of optimism for the next nine months. Our team has a record unsullied by defeats, goals conceded and woeful open-goal misses, and we feel good about that. We all feel that somehow this is going to be our year, even if, as has happened often with Leeds United in the last few years, the reality of the squad of players assembled together before you like a patchwork quilt, screams otherwise. And that is pretty much where us Leeds United fans are right now, except we have just a little bit more optimism than we usually have, partly based on the fact that the 2016/17 season was the first campaign in what seemed like an eternity, to give us tangible belief that we might one day escape the tedium of the second division. But also because our summer recruitment has been pretty solid and inspiring. While there are still sizeable holes in our squad which could still be addressed before the end of the transfer window, on the whole we have a first team pool that has more quality options than it has done for many, many years. It seems a long time since the unknown Thomas Christiansen first walked amongst us like a novice sales rep at his first annual conference, and it is to be hoped that his time has been used wisely. The prospect of making an impact on Leeds United in a short space of time can be a daunting one, even if you have the years of experience or the hide of a rhino like a Sam Allardyce or, dare I say it, a Neil Warnock. For Christiansen, he needs to first earn the respect of a set of players who have literally never heard of him, and then implement methods and a mentality that will make them a better set of players than the one that finished narrowly outside the play-off places last season. That’s a tough ask, even if you have comparable experiences to draw upon, and it’s fair to say that Christiansen needs a huge amount of uncontrollable factors to fall in his favour. But one thing Leeds fans can control and where we can help him out, is by allowing him a little patience and lowering his immediate expectations. Of course it is the familiar trait of a football fan to expect your team to come racing out of the blocks at the start of the season, and immediately shrug off the shackles of a non-competitive summer like a hibernating groundhog unleashing itself on another year. Unfortunately it doesn’t always work out like that, and we seem to accept the fact that footballers effectively forget how to play the game in the six weeks they have off between one season and another, and it takes a few weeks to get back up to speed. Add to that the hefty turnover of players and the annual implementation of new coaching methods, and it’s fair to say that the first month of the season is rarely a good indication of how the season as a whole will go, and that is very much how last season started off under Garry Monk. Twelve months on we are in a very similar situation, except that we have the optimism of new ownership and a raft of crowd-pleasing measures, plus the very unfamiliar scenario of having purchased players that other clubs actually wanted to buy too, but instead they chose Leeds. It is that feeling of actually competing with other clubs in our own division, beating them to players, and acting like a big club again that provides a warm fuzzy feeling as the new season approaches. Off the pitch, in the stands, the Leeds fans have never wavered, and have remained a constant reminder of the potential Leeds United has; the one ingredient of the club that is always there to project an image of a fully-functioning travelling behemoth, even if in the background there has been chaos, financial thrift and a wafer-thin infrastructure. And at the Old Peacock we are fully aware of that. That feeling of unbridled optimism every Leeds fan feels in August, is pretty much what we see every matchday as soon as we open our doors. The buzz of anticipation prior to kick-off at any stage of the season is evident in the thirst and hunger with which you lot approach every game; there’s nothing like the prospect of another 90 minutes, and whatever your thoughts on the current state of the team and the club, every match starts 0-0 and you just never know what might happen; except that Gaetano Berardi almost certainly won’t score. But the feeling at the start of another 46-game season magnifies this tenfold, particularly when the club has not just bought the likes of Vurnon Anita, Samuel Saiz, Ezgjan Alioski and Caleb Ekuban, but has also spent a pretty penny on securing Elland Road after it has spent 13 years under anonymous and murky ownership. 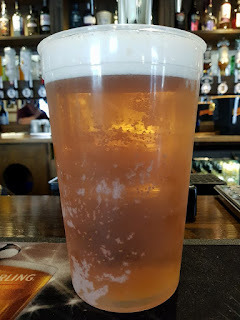 And what’s more, at the Peacock we will have our regular live band, The Snapp, back for every Saturday home game, new food options, Paolo the Peacock to keep the kids occupied and another development to help cut the matchday beer queues a little bit; two pint pots! Why just buy one pint per visit when you can save time and buy two? It’s a simple concept and something we have introduced to hopefully get people served a little quicker this season. So the new season is upon us, and we have a rush of home games before another long and miserable break until September. We had a small taster of what’s to come with the home friendly versus Oxford United last Saturday, but that was mere child’s play. Including the League Cup, we have three home games in less than a week coming up shortly, so it is a baptism of fire in terms of breaking in the new season. Port Vale will be welcomed to Elland Road on Wednesday 9th August for a League Cup tie, and Preston North End are our first league visitors on Saturday 12th August when we are expecting a big crowd approaching 30,000. The following Tuesday 15th August our visitors are Fulham, but then we have a break until September 9th. And by then, maybe we will need it? This new season enthusiasm creates a hell of a thirst if the past few years is anything to go by. But we’re not complaining and we can’t wait to see the pub bursting at the seams again, it’s been too long. And it’s been way too long since Leeds fans have had genuine reasons for optimism leading into another Championship campaign, but right now I think we do. So let’s navigate this first month, stay strong and focused and not get too carried away with results either way, and re-group again in September to see where we are.